The Heavy Grips? hand gripper series was developed for athletes who want to take the training of their grip strength to the next level. 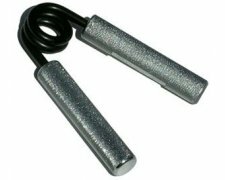 If you want to develop serious hand strength for a sport, or just want to impress your friends, than the Heavy Grips? hand grippers are the perfect choice for you! If you're worried about working hard, getting sore hands and possibly some calluses on your fingers, than this product is not for you! Choose which models of HeavyGrips(HG) you would like to receive from the HG100 "Beginner"